Four people, including BJP leader Mukul Roy, were charged on Sunday in connection with the killing of the Krishnaganj MLA in Nadia district. Abhishek Banerjee dubbed the BJP's claims as "propaganda" to "hide its sins". 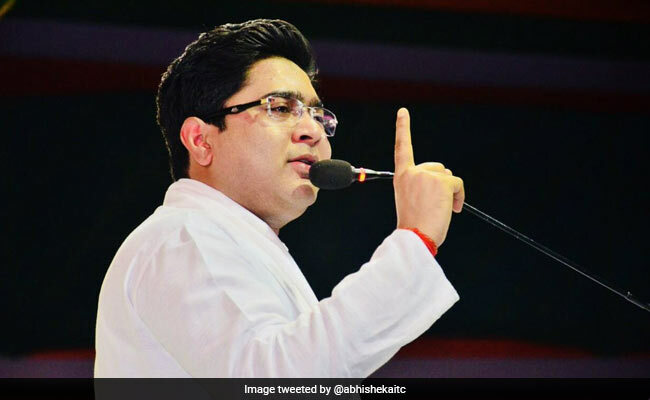 Trinamool Congress leader Abhishek Banerjee Monday said those involved in the killing of his party's MLA Satyajit Biswas will not be spared and they "will be pulled by the collar and brought back to Kolkata" even if they flee the city. "If someone feels that he can escape after the killing of TMC MLA Satyajit Biswas, then he is living in a fool's paradise," Mr Banerjee told reporters after visiting the family of the MLA. "If someone thinks that he can run away to Delhi and escape the law, then he can be rest assured that we will pull him by his collar and bring him back to Kolkata," the TMC Youth Congress president and nephew of West Bengal Chief Minister Mamata Banerjee said, without naming anybody. Four people, including BJP leader Mukul Roy, were charged on Sunday in connection with the killing of the Krishnaganj MLA in Nadia district. Mr Roy has denied the allegation. The BJP has also denied any involvement in the killing of the lawmaker and claimed that it might be the result of infighting in the Trinamool Congress. Mr Banerjee dubbed the BJP's claims as "propaganda" to "hide its sins". "If there is infighting (in the TMC), BJP should name the two groups. Why isn't it naming them? It should. The fact is that the BJP is trying to vitiate the atmosphere ahead of the Lok Sabha elections," he said. When contacted by PTI, Mr Roy said, "He (Abhishek Banerjee) didn't name anyone so I won't say anything... But I will say that wherever TMC leaders and cadres are murdered, they are blaming the BJP. They (TMC) should first try to control their infighting." A former TMC MP and right-hand man of Mamata Banerjee, Mr Roy joined the BJP last year after his relations soured with the chief minister. Two of the four people booked for the killing -- Kartik Mondal and Sujit Mondal -- were arrested on Sunday and remanded to police custody for 14 days. The officer in-charge of local Hanskhali police station and the victim's personal security officer were suspended amid allegations that there was no security cover despite the presence of the MLA and minister at the Saraswati Puja celebrations venue, where the killing took place on Saturday.